Thousands of Kenyatta's supporters and several heads of state attended Tuesday's inauguration, which took place at a stadium in the country's capital. Uhuru Kenyatta was officially sworn in for a second term as president of Kenya. According to local media, thousands of Kenyatta's supporters and several heads of state attended Tuesday's inauguration, which took place at a stadium in the country's capital. But outside the venue, police reportedly used tear gas to stop crowds of people trying to force their way into the stadium to witness the ceremony. And authorities elsewhere in the city took similar measures to stop anti-Kenyatta protests. The swearing in came nearly a month after Kenyatta won the country's presidential election for the second time this year. Kenya's election commission said he secured roughly 98 percent of the vote. Kenyatta also won the country's initial presidential election, which took place back in August. His main opponent, opposition leader Raila Odinga, claimed those results were tampered with. Kenya's Supreme Court voided the election after deciding it was "not conducted in accordance with the Constitution and the applicable law." 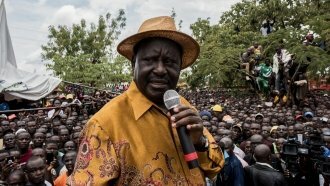 But not long before the repeat election was scheduled to take place, Odinga withdrew from the race. He argued that election officials couldn't oversee a fair vote. Kenyatta's second term in office will last for five years.